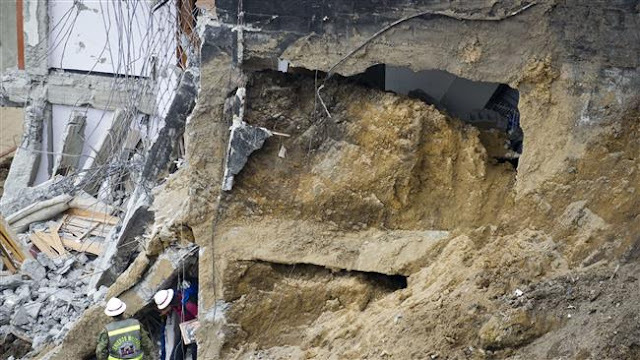 Manizales 'is literally cut off by rock slides, mudslides, floods,' Mayor Jose Octavio Cardona told local radio stations. Flooding and mudslides in central Colombia have killed at least eight people, the Red Cross said Wednesday, causing alarm in a country still recovering from mudslides that killed hundreds. At least 20 people are missing after torrential rains lashed the city of Manizales, officials said, raising fears the death toll could soar as it did earlier this month in the southern city of Mocoa. There, at least 323 people including more than 100 children were killed when heavy rain caused three mountain rivers to flood on March 31, hurling a tidal wave of mud and boulders into the city. Manizales "is literally cut off by rock slides, mudslides, floods," Mayor Jose Octavio Cardona told local radio stations. President Juan Manuel Santos suspended his official agenda to travel to the city, the capital of Caldas department - which is, like Mocoa, a remote and difficult region to access. He said on Twitter he had ordered officials from the emergency agency and transport ministries to the city to assess the "grave situation." On the fifth of April it was reported; The death toll from the landslides that devastated Colombia's southern city of Mocoa on Saturday had risen to 323. The mudslides in Mocoa were caused by the overflow of three rivers passing through the city as a result of a heavy downpour on Friday night, which subsequently swept away several neighbourhoods. The National Institute of Legal Medicine and Forensic Sciences said in a statement that 323 people had died and so far 161 of the victim's bodies had been returned to their families. According to the latest report from the Colombian Red Cross, at least 323 people had been injured with around 250 still missing. Further south Peru's death toll from similar floods is at almost 100.